Revelstoke's my hometown. When you're familiar with a place you can sometimes take for granted how beautiful and interesting it is. On a recent visit I decided to take my camera and try to see Revelstoke from a different perspective. Lifesize bronze Grizzly Bears guard the entrance of Grizzly Plaza in downtown Revelstoke. This is a new sculpture addition to downtown and I'm really not sure what to make of it. 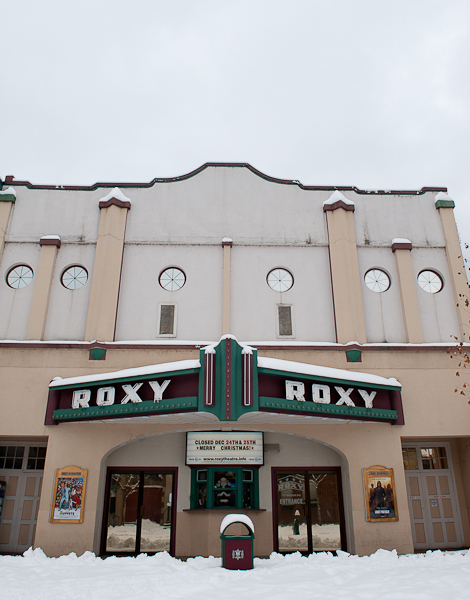 Roxy Theatre, circa 1904. I spent many a Saturday afternoon nestled in one of the box seats of this theatre. Time stands still in my little hometown. The whole downtown core was revitalized in 1986 and buildings were restored to their original facades revealing Victorian designs.